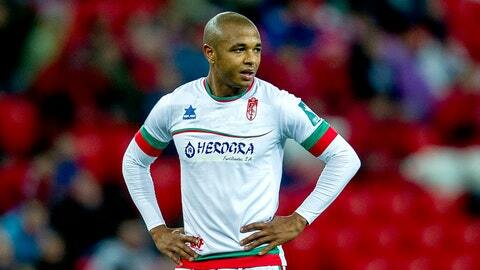 Granada's Yacine Brahimi scored his side's winner vs. Elche on Saturday. Espanyol and Levante played out a goalless draw which suggested that neither of them will be in Europe next season. The pair could not be more mid-table and had both highlighted this as a game to win if a late run for a Europa League place was to materialize. Neither was capable of getting a three-point haul, though, and despite an entertaining start, the reality dawned after the break and the game died a death. The early exchanges were good, though, and the only surprise was that a goal did not arrive. Granada moved a step closer to securing their Primera Division status for another season with a 1-0 win over 10-man Elche at Los Carmenes. Yacine Brahimi’s strike midway through the second half settled the contest in favour of Granada, who made it three home victories on the bounce following their successes over Villarreal and Real Betis. It could have been a more comfortable victory for Granada in the end but Fran Rico missed from the spot in the 73rd minute after visiting defender Cristian Sapunaru had been sent off for bringing down Youssef El Arabi. Fortunately for Rico, Granada were not made to rue that miss as they held on for a win that will further ease their relegation fears. Real Valladolid and Rayo Vallecano shared a 1-1 draw which does little to help either side in the fight to avoid relegation. The hosts took an early lead through a Jose Ze Castro own goal, but Alberto Bueno levelled things up with a goal against his former club before half-time. The result means Valladolid will end the weekend still in the drop zone, three points worse off than their opponents and with just one win in their last eight matches. Rayo came into the fixture on the back of three successive wins, but could have trailed after just 20 seconds on Saturday when Javi Guerra fired narrowly wide of the left post.